Money and compensation is one of the most significant details in California truck accident cases we deal with. Big rigs, 18-wheelers, semi-trucks — these huge and powerful commercial vehicles are everywhere on our roads and when a crash occurs, highways are often shut down, damage can be extensive, and complicated injuries can be catastrophic and enduring. In some cases only the family of a loved one is left behind to deal with the painful pursuit of justice in a wrongful death lawsuit. If you need immediate assistance pursuing justice and compensation in the aftermath of an accident involving a semi truck or large commercial vehicle, please reach out 24/7 to the Law Offices of David Azizi by calling 800-991-5292. We are here to help you find the strongest way forward in this difficult time. Remain alert and assess any offers for a quick out of court settlement from trucking companies for your injuries and losses — often an indicator that they do not want the full extent of their financial responsibilities to be uncovered and paid. California semi truck attorney David Azizi shares his experience recovering a settlement of $4,950,000 for an injured client who was harmed in a crash with an 18-wheeler truck. Compensation in these amounts or greater is not uncommon in cases involving large commercial trucks. How Do I Win Compensation In A Truck Accident Lawsuit? There are many important legal steps to take after a truck crash in order to give yourself and your loved ones the very best chance to recover the financial compensation you deserve. In this audio podcast, California truck accident lawyer David Azizi answers the most significant questions about lawsuits and compensation in cases involving a collision with a big rig, 18-wheeler, bus, and other large large trucks and commercial vehicles. Play the episode below. You might be curious to know just what kind of compensation is possible to recover in California after an accident with an 18-wheeler, semi-truck, construction truck, or similar. The truck crash compensation calculator can give you an educated guess at your settlement amount and will better prepare you for a first meeting with a Los Angeles truck crash law firm. In California law, winning compensation in a truck crash lawsuit is known as “recovering compensatory damages,” or “money damages.” When someone causes you harm for something that was in their control to prevent, California law entitles you to seek financial payment for what they’ve done in order to restore justice and make you whole again in the eyes of the law. This award of compensation is called damages, and the most common ways these payments come in truck crash cases are either through a settlement (an agreement between both parties both in or out of court) or a verdict from a judge and/or jury. Accidents involving big rig trucks, 18-wheelers, and semi-trucks are normally very significant cases. As demonstrated by several of our own truck accident lawsuits, like this Budweiser 18 Wheeler Accident case won for our clients, damages can sometimes run into millions of dollars. With so much on the line during a difficult time, it’s important to have high standards when choosing a truck accident lawyer in Los Angeles and all of California, where semi-truck collisions kill more people each year than in any other state. 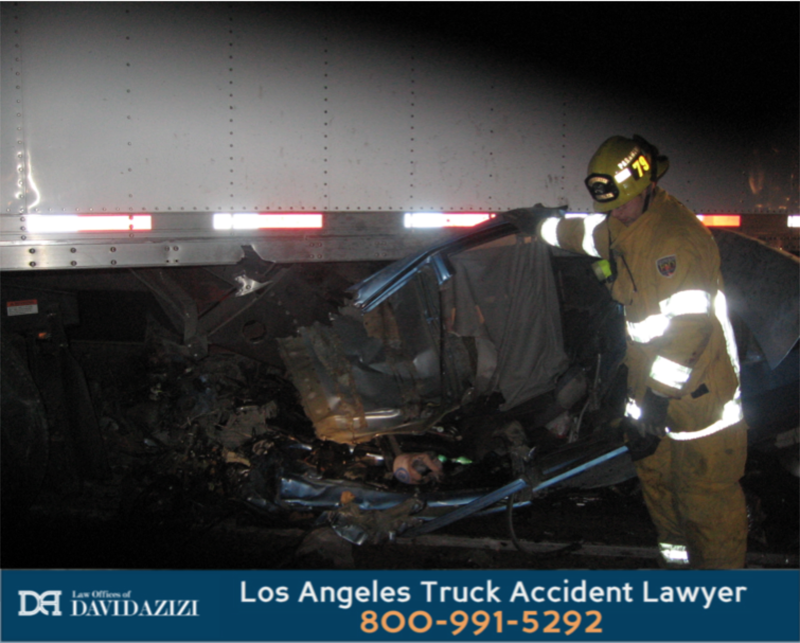 Attorney David Azizi and our Los Angeles truck crash legal team work on a payment structure known as contingency, or a contingent fee. That means our success only comes when yours does. We will invest all of the financial resources and money up front for your truck crash case. You are putting your confidence in our team, and if we do not win your case, you do not pay us. 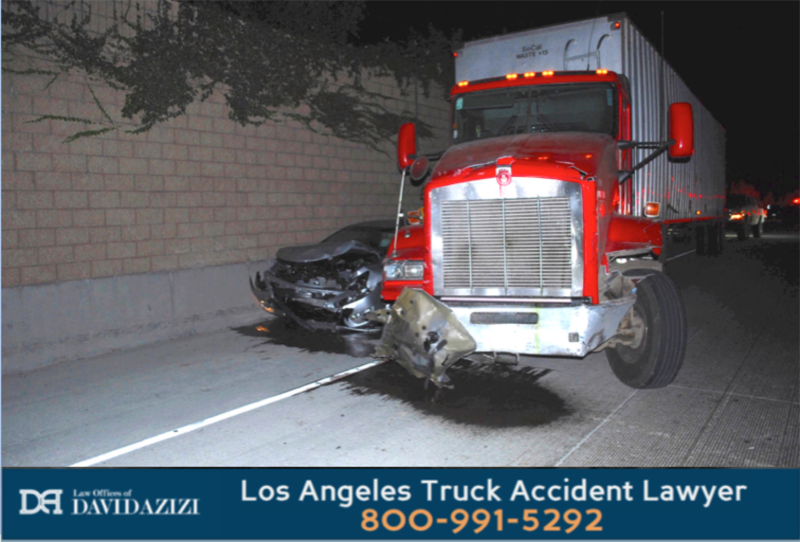 If you or your loved ones have been injured in an accident with a big rig, semi-truck or other large commercial vehicle anywhere in the state of California, the Los Angeles based Law Offices of David Azizi are ready to provide you with a free case review so you can know where you stand with your claim of wrongdoing and demand for compensation and money damages. We need to hear your important story so we can begin developing your unique trucking accident lawsuit strategy. Our clients are going through a very difficult time, and winning compensation in a settlement or verdict cannot undo the wrong that has been done to you, but it is a significant step forward in making you are your loved ones whole again in the eyes of the law. Reach out to our team 24/7 by calling 800-991-5292 or filling out the free case review request form on this page. We are ready to get to work for you on your unique and important truck accident case.